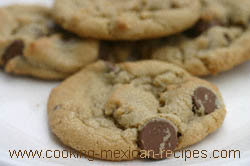 Did someone say they were looking for a chocolate chip cookie recipe on our Mexican recipe site? Well have I got one for you. When you make these homemade chocolate chip cookies, everyone in the house will venture into the kitchen to see what smells so good. If you are looking for a crunchy type cookie then this recipe is not for you. This recipe makes the most buttery, moist, chewy, chocolatey cookie around. It has an ingredient you don’t often see in a chocolate chip cookie recipe. This ingredient, which I will reveal in a moment, gives the cookie an added dimension in subtle flavor and a little more texture. It kind of reminds me of Mrs. Fields chocolate chip cookies. In fact this recipe is suppose to be a close match to Mrs Fields chocolate chip cookie recipe. Feel free to change the chocolate chips to semi sweet if you prefer dark chocolate in your chocolate chip cookie recipe. I’m a milk chocolate fan in most cases except when it comes to my toffee recipe. So what is the unusual ingredient that I use? It’s oatmeal grounded up into oatmeal flour or you can buy oat flour. I like the flavor the oatmeal brings to the cookie without changing the texture too much. I also go for quality ingredients here. I use real butter and the best chocolate chips I can find. I like Guitard’s milk chocolate chips as the chocolate is real smooth and melt-in-your-mouth creamy. The chips are bigger than Nestle’s chocolate chips and in my opinion, beats Nestle’s hands down. So if you like big chips that have great flavor, look for Guitard. There is no comparison. Take the butter out of the refrigerator to soften for a half an hour or so. You can also use the microwave to soften it too. Put the setting on defrost and cook for 10 to 15 seconds. Remember, you want to soften, not melt the butter. Use a blender or food processor to grind the oatmeal into flour if you are making your own. In a blender grind about 3/4 of a cup at a time. Set aside in a bowl. Mix these ingredients until well blended using a heavy duty mixer like a kitchen-aid. In a small bowl mix the eggs with the vanilla with a fork until well blended. Add the eggs and vanilla to the sugar mixture. Beat until mixed in but don’t over beat. Mix with a spoon until all the flours are blended. Now add the flour mixture 1/2 of a cup at a time to the sugar/egg mixture until all the flour is mixed in. When all the flour mixture is blended in, add the chocolate chips by folding them in until they are evenly distributed. Drop by teaspoon or tablespoons depending on the size you want, on to an ungreased cookie sheet. Leave room for cookie expansion while they bake. Bake at 350 degrees for 9 -11 minutes. Remove cookies from the oven and let them cool for 5 minutes before placing them on wax paper (or cooling racks) to cool completely. Letting them cool on wax paper seems to keep the cookies soft and chewy. Once the cookies are cool, store them in a Ziploc bag. If you like your cookies on the softer, chewy side, cook them for the shorter time period. Chill your cookie dough before baking and the cookies won’t flatten out as much. I like to freeze this cookie dough so I can serve chocolate chip cookies anytime. Shape the dough into 1 1/2 to 2 inch balls and wrap them in saran wrap. Then place dough in a Ziploc bag. Double wrapping them will help prevent freezer burn. When it’s time for cookies, take the bag out of the freezer to thaw for 15 min. and cook as above. Try this chocolate chip cookie recipe and see if it doesn’t become your favorite cookie recipe.